Volkswagen have perhaps been a little slow to join in, but they too have now added an all-important compact-class SUV to their line-up. In fact they’re adding two; it’s a booming market after all. 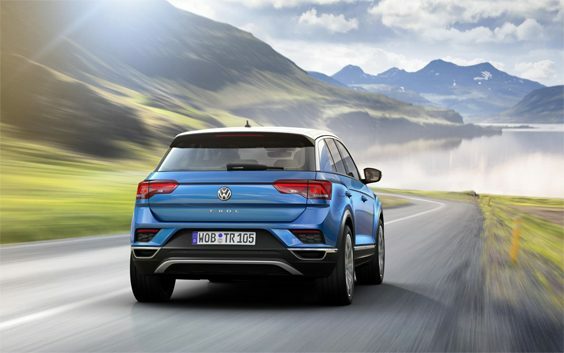 Until recently if you wanted a VW with a raised ride height and go-almost-anywhere looks your options were either the somewhat large Touareg, the established and very popular Tiguan, or if your plans for going into the gooey stuff were a little less extensive, the genuinely lovely but not nearly as rugged, Passat All-track. Now though there’s this: It’s called the T-Roc and as you might have guessed by its appearance it’s based on the Golf – which, by our reckoning is no bad thing. Incidentally and perhaps predictably, the T-Cross due out later this year, will be based on the Polo. So far then, so Volkswagen. And that’s certainly the impression you get when first encounter the T-Roc: its styling means it really couldn’t be anything else. It’s sharply creased in that suburban way VW do so well, chunky and muscular enough not to be embarrassed by its nearest competition (think Audi Q2, Mini Countryman, Nissan Qashqai, Toyota c-HR, etc. etc.) and it even gets a coupe-like roof-line. It’s actually rather attractive. You can personalise it too, courtesy of a bold variety of exterior hues and contrasting roof and pillar colours. No doubt some owners will do the personalisation thing better than others, and thus suffer the consequences come trade-in time, but thankfully our T-Roc came in a nicely reserved combination of Ravenna Blue with contrasting black roof. Our car got also got the similarly coloured personalisation treatment on the inside. The T-Roc can have a range of body coloured interior inserts for the dashboard, door caps and centre console that brighten what otherwise might be considered a trademark dark VW interior. Said inserts also play their part in masking what in some respects might be considered a decidedly less premium feeling interior than VW’s usual fayre of late too. While all the bits you touch most often are soft and well-engineered in feel – steering, wheel, column stalks, heater knobs, touch screen etc. – the dashboard panels, the door trims and the door handles are, unusually (for VW), hard, scratchy and hollow feeling. If there’s one place to pick fault with the T-Roc it’s here – Volkswagen were clearly working to a budget on this one! What can’t be faulted however is the way T-Roc drives – and especially so if you pick the smallest engine option. Strange maybe, but in this case true. When fitted with Volkwagen’s 1.0 litre TSi engine not only is the 3-cylinder engined T-Roc over 200kgs lighter than some of its contemporaries. it’s more responsive to your inputs. The steering is sharper, there’s less of that tell-tale SUV body roll during cornering, and everything just feels more, well… eager. The 3-pot motor does add a little vibration, and you will have to drive it very carefully (think like a maiden aunt) if you want to achieve anywhere near its claimed 55.5 mpg figures – I struggled to better 44 – but for the character it adds, it’s worth it. With a 0-62 time of 10.1 seconds and a healthy dollop of torque between 2000 and 3500 rpm it’s probably all the engine you really need. Unless that is you need four-wheel drive, VW’s 4Motion system is only available on larger capacity 4 cylinder T-Rocs. VW incidentally say that 80% of all T-Rocs sold in the UK will be petrol-powered. All T-Rocs come with Automatic Post-Collision Braking System, the active lane keeping system Lane Assist and the Front Assist area monitoring system with Pedestrian Monitoring and City Emergency Braking. Higher specs add up to another ten further driver assistance systems including adaptive cruise control (ACC), Rear View reversing camera, Rear Traffic Alert, Blind Spot Monitor, Lane Assist, Park Assist Traffic Jam Assist and Emergency Assist. 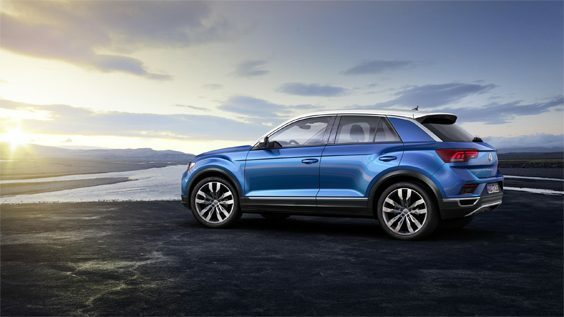 The T-Roc also scored 96% for driver and passenger safety when tested by NCAP. All in all then the T-Roc offers a pretty comprehensive package, it seats 5, it’s built well, it drives nicely and it looks good and it wears the right badge. What’s not to like? Oh yeah, those hollow interior plastics. 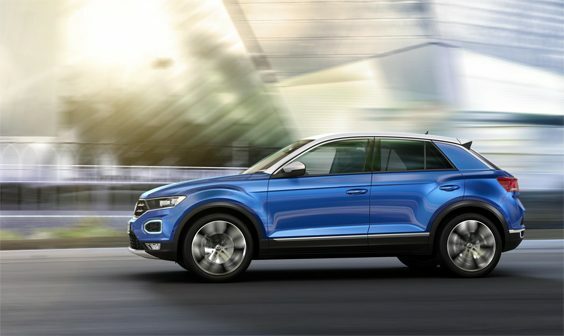 VW is planning for the T-Roc to make a significant contribution to its already very healthy sales figures. If it does (and they address those minor interior issues) like the Golf upon which it’s based, it might with time become the benchmark of its class; the SUV upon which all others are judged. Transmission: 6 speed manual Front-wheel drive.